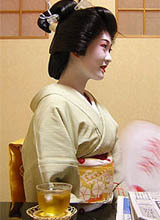 The geiko will just listen to any story and will have a conversation about anything. Sometimes the clients are enjoying a particular technical story and their conversation becomes a lullaby to my ears! I tell myself 'Listen and learn' but sometimes it's hard.